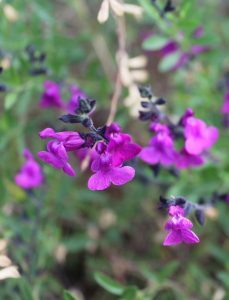 This purple flowered royal sage has impressed us for years with its hardiness to cold, true purple flowers and tolerance of cold winter wet. A loose spreading perennial that adorns its tips with royal purple flower from June to frost. Never dense it prefers full hot sun and very well drained soils and light but consistent summer water. To 18″ tall by 2′ wide in time. Do not cut back until new growth pushes in spring. It needs a woody framework of branches to protect the overwintering crown. Takes blasting hot conditions. Moderate deer resistance.